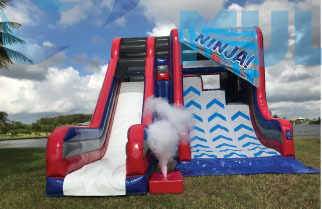 Become an Ninja Warrior and conquer the Inflatable Ninja Wall! 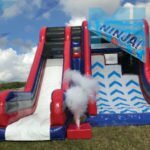 The Ninja Wall is an inflatable warped wall with 3 different deck heights. Run up the specially designed warped wall which is firm even though it is 100% inflatable. Non slip vinyl ensures you have enough grip to make it to the top! If you need a helping hand there are removable PVC grab bars to pull yourself up onto the deck; once at the top its a left turn to slide down back to the start. We deliver to the following area's: Appleton, Beaver Dam, Beloit, Cedarburg, Cudahy, Delafield, Delavan, Eau Claire, Elkhorn, Fitchburg, Fond Du Lac, Fort Atkinson, Franklin, Glendale, Green Bay, Greenfield, Hartford, Janesville, Kenosha, La Crosse, Lake Geneva, Madison, Manitowoc, Marshfield, Menasha, Menomonie, Mequon, Middleton, Milwaukee, Muskego, Neenah, New Berlin, Oak Creek, Oconomowoc, Oshkosh, Pewaukee, Port Washington, Portage, Racine, Ripon, St. Francis, Shawano, Sheboygan, South Milwaukee, Stevens Point, Stoughton, Watertown, Waukesha, Waupaca, Wausau, Wauwatosa, West Allis, West Bend, Whitewater, Wisconsin Dells, Wisconsin Alton, Arlington Heights, Belleville, Belvidere, Bloomington, Bolingbrook, Bourbonnais, Bradley, Cahokia, Canton, Carbondale, Centralia, Champaign, Charleston, Chicago, Cicero, Danville, De Kalb, Decatur, Dixon, Downers Grove, East Peoria, East Saint Louis, Edwardsville, Effingham, Elgin, Evanston, Freeport, Galesburg, Glen Carbon, Godfrey, Granite City, Herrin, Jacksonville, Joliet, Kankakee, Kewanee, Lincoln, Lovers Park, Machesney Park, Macomb, Marion, Mattoon, Moline, Morris, Morton, Mount Prospect, Mount Vernon, Naperville, Normal, Oak Lawn, Oak Park, Ottawa, Pekin, Peoria, Pontiac, Quincy, Rantoul, Rock Island, Rockford, Skokie, Sterling, Streator, Taylorville, Urbana, Washington, Waukegan, Wheaton, Wood River and Zion Also serving all of Northern Illinois and Chicago.